2017 was a great year for right leaning political types. The schadenfreude of butthurt leftists was in full force and I have to say, I enjoyed every minute of it. Overgrown children with arrested development thinking they are cutting edge for believing the failed ideology of Karl Marx are always fun to laugh at when they have tantrums. Without further ado. The top 5 triggered campus liberals in 2017. A University of California at Riverside student stole the iconic red “Make America Great Again” off the head of a Trump supporter. She went on a huge ramble saying it represented genocide and showed us all what the brainwashing of students looks like firsthand. She looked ugly on the inside as well as the outside and seemed angry for no apparent reason. This is what happens when you send your children to college. They go in looking like normal, healthy, attractive people and come out looking like a mental institution patient. A University of Illinois graduate student Tariq Khan was arrested after challenging Trump supporters to a fight on campus. He was arrested on assault charges after charging the students and knocking the phone out of one of the hands of the students. This is what happens when you tie your self-worth to your political ideology and your political candidates. You justify violence against the other side because you are acting in philosophical self-defense. A student-run coffee shop at Fordham University tried to kick out some conservative students because they were making the coffee shop an unsafe space by wearing “Make America Great Again” hats and Donald Trump paraphernalia. They said their clothing was making other students uncomfortable. Well, you know what I find to be uncomfortable? The entire ideology of the left. They want to take more and more of my hard earned money and give it to illegal aliens. But I don’t try to throw them out of coffee shops. 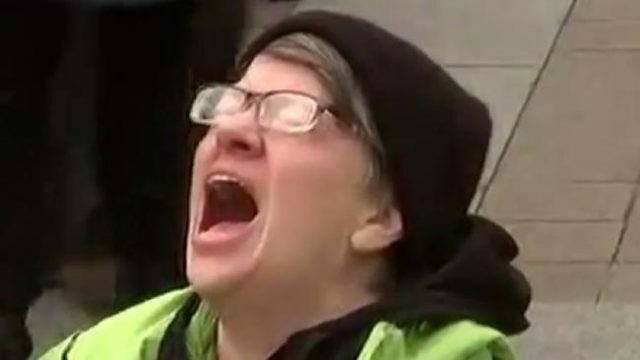 A Western Washington University student was so distraught, so triggered that the only thing she could do was scream at the sky when she saw a Donald Trump sign on campus. What an idiot. I’m surprised they let someone with a single digit IQ into college. But then again, we all know colleges don’t educate anymore, they indoctrinate. And a moron’s money is just as good as any one else’s. What was your favorite meltdown of 2017? Did we miss any good ones? Let us know what you think!